Many of the pictures on this page are taken from the book William Shakespeare by Andrew Gurr. 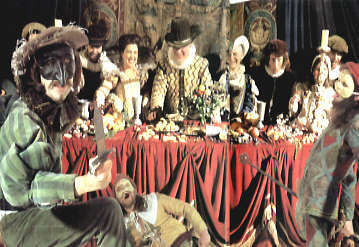 The book includes a large number of reconstructions of scenes from Shakespeare's life. The pictures were directed by Julian Napier and photographed by Dominic Clemence. The photos on this page of present day Stratford are my own. 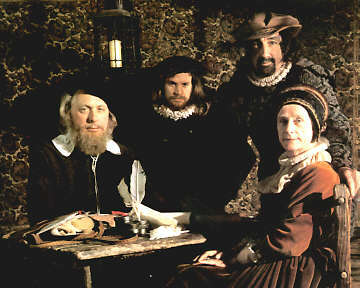 This first picture shows young William Shakespeare with his father, John Shakespeare, and his mother, Mary Arden. John Shakespeare was a glove-maker, and this picture shows Willam and his brother Gilbert helping their father in their father's workshop. Young William would have attended the King Edward's Grammer School in Stratford. 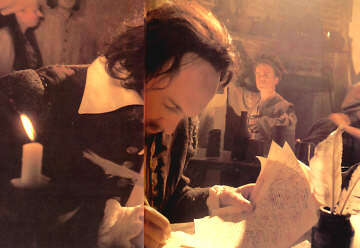 After leaving school at around 14 it is likely that Shakespeare went to learn his father's trade in his father's shop. When he was 18, Shakespeare married Anne Hathway, who was a few years older than himself. Anne's original home was a farmhouse, now known as Anne Hathaway's Cottage. 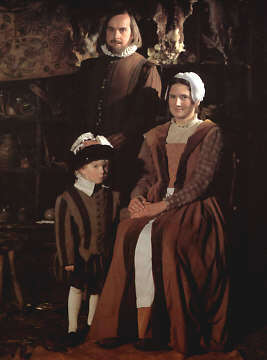 Anne had been the eldest of 3 sisters, and their father had died a year before Anne and Willam were married. One of William's earliest poetic works is a sonnet (number 145) written to Anne. 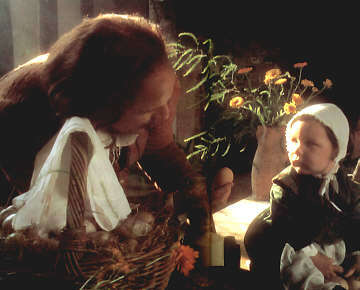 Anne and William had their first child, Susanna, in 1583. Susanna was followed by twins, Judith amd Hamnet, 2 years later. There was general economic hardship in Warwickshire at that time, which seriously affected Shakespeare's father's business and the Shakespeare family. William needed to find other employment. His early sonnet to Anne shows his interest in writing, but there was no such work locally. 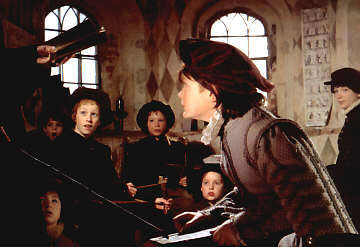 Fate brought William into contact with a travelling theatre company, and he joined them, as an actor. Travelling companies of actors would perform at market fairs, or at great country houses. Each company was under the patronage of some wealthy nobleman. The Earl of Leicester (who lived at nearby Kenilworth Castle) was the patron of one local company. 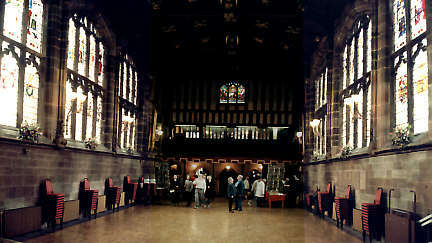 The picture below shows the Guild Hall at nearby Coventry which was also used for such performances. 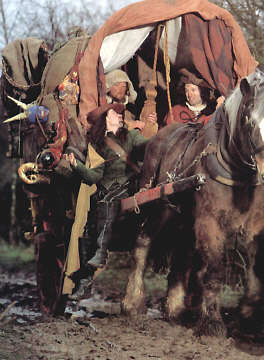 The travelling company of actors took Shakespeare to London. 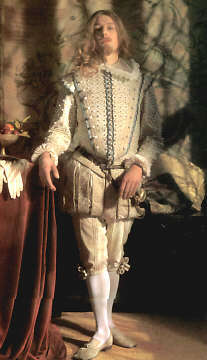 Little is known of Shakespeare's early years in London. He must have pursued his writing after his day's work, in the taverns where he was lodging. By 1592, when he was aged 27, Shakespeare had established himself as both an actor and writer. This picture shows the Earl of Southampton, a very rich young gentleman, to whom Shakespeare dedicated two of his earliest works, and who was an early patron of Shakespeare. Beside his great philosophical explorations, Shakespeare's time in London was one of intense personal emotions, reflected in the content of his Sonnets. Some of these are attributed to an unidentified figure known as the Dark Lady. Until 1596 The Chamberlain's Men had used a theatre in Shoreditch, which needed replacement. 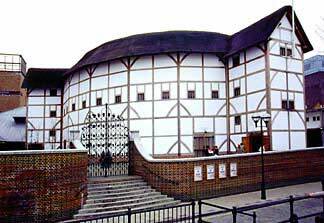 In 1598 the conpany decided to finance the construction of a new theatre, The Globe. The money was raised by contributions from members of the company. Shakespeare who made substantial profits from his share in the scheme. The Globe theatre has recently been rebuilt, very near to the site of the original, and closely resembling the original. 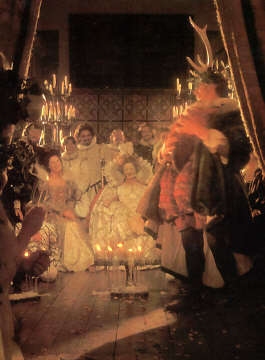 This picture shows a performance of The Merry Wives of Windsor before Queen Elizabeth. In 1603 Queen Elizabeth died, without an heir. She had appointed James VI of Scotland to be ruler of England on her death. The Chamberlain's Men soon secured the favour of the new King, and became known as The King's Men. Shakespeare's play Macbeth was composed soon afterwards in gratitude to the new King. Throughout his time in London Shakespeare lived in lodgings, and sent money back to maintain his property and investments in Stratford. 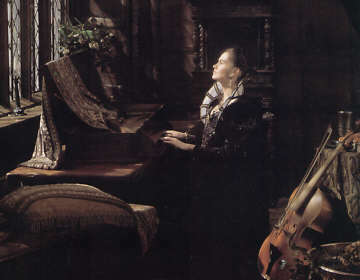 He always maintained the intention of returning to Stratford someday. 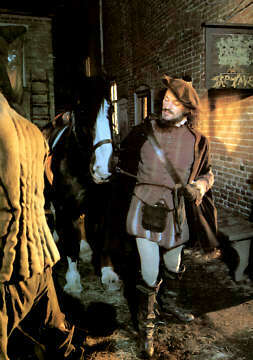 This picture shows Shakespeare travelling back to Stratford, by horse, and staying overnight in Oxford. He may have returned to Stratford each year during the period of Lent when the playhouses in London would have been closed. In 1610 Shakespeare returned to Stratford permanently to manage his investments and properties. Shakespeare's final play, The Tempest, was probably written in comfort in Stratford. In 1613, the Globe was burnt down in the Great Fire of London. The company rebuilt the theatre, but Shakespeare was no longer part of the company. 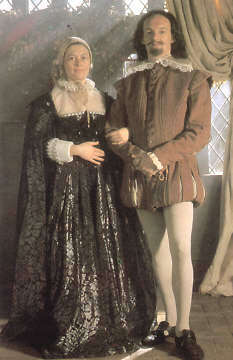 Shakespeare's daughter Susanna married a Stratford doctor John Hall. 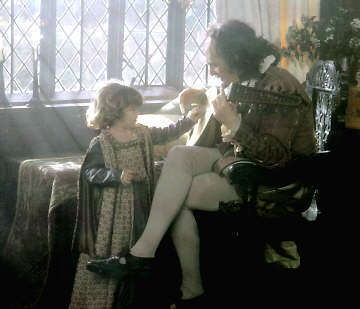 This picture shows Shakespeare with Susanna's daughter Elizabeth, at New Place in Stratford. 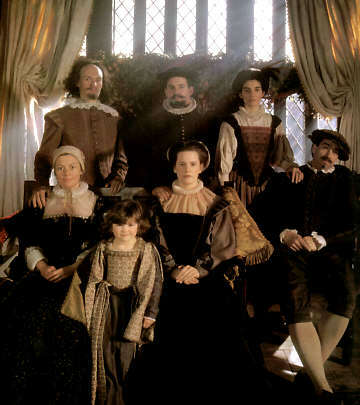 This family portrait shows (back row) Shakespeare, Dr John Hall, Judith (Shakepeare's other daughter), (centre row) Anne Hathaway, Susanna, Thomas Quiney (a friend of Judiths), (front) Elizabeth (Susanna's daughter). 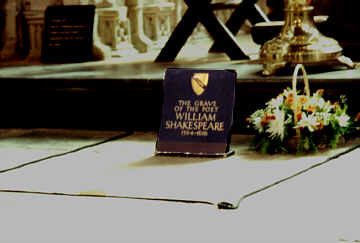 Shakespeare died in Stratford on 23 April 1616, and now lies in Holy Trinity Church Stratford.